The route is above (left) of the lake Stöðuvatn at the farm Kvísker. The water from the stream that forms the route goes right under the small hydro power house next to the lake. The route is in 3 short steps, the middle one is longest, but the top step is vertical, so it is the reason for the 4 in the grade. The best thing about the route is very beautiful surrounding and also, it is in the shade so it is quick to be climbable, and stays long after most other routes have gone. 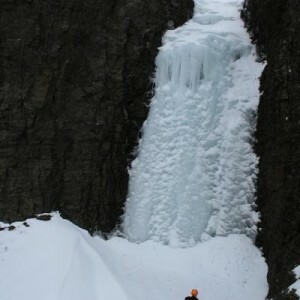 This is the main waterfall in Bæjargil in Kvísker. We parked the car at Stöðuvatn lake and walked across the ridge between the lake and the gorge Bæjargil, and descended down to the route. After the climb we could walk down a hiking trail down the cliffs east of the gorge. The first pitch is 20 meter of nice WI 3. Then we had to walk around a corner in the gorge. Careful not to break through and fall into the stream. There was another 15 meter WI 3 wall there, and some easy steps higher up. We walked up from the gorge close to the small dam that collects water for the power station down at lake Stöðuvatn. 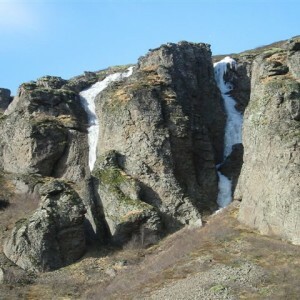 The very top of the gorge Þvergil in the altitude of about 500 meters (Þvergil is a gorge that runs parallel with Múlagljúfur and enters it at the lowest part. 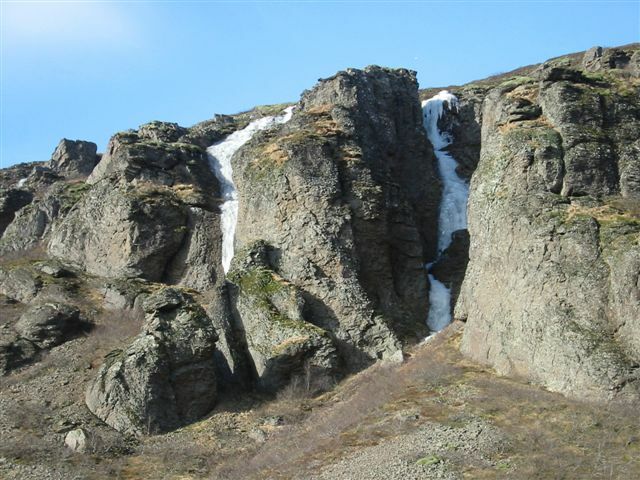 We wanted to climb a beautiful unclimbed 50 m WI 4 waterfall lower down in Þvergil (can be seen from the main road close to Hrútá) but it was too wet. Instead of doing nothing we continued up to this small route. In the bottom of Bæjargil starting 3 meters left of the main stream waterfall that falls into the gorge. Best to walk up on the small hill just behind the farm and then descend into the gorge close to the route. The route starts 70° for the first part, then there are some easier steps, but the second short pitch was the most spooky. 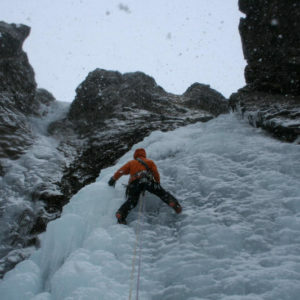 In our warm conditions we had to climb very carefully to get to the top of the route. Normally there should be plenty of good ice all the way. In Bæjargil in Kvísker, just right of Kerling WI 3+ wich is the most obvious line there. 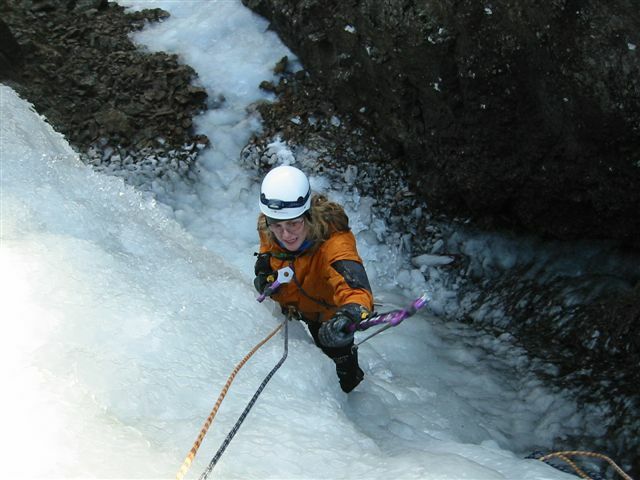 The route starts up a small ice wall, then scrambling through tree filled gully up to the main part of the route, an 75° 30 m wall. 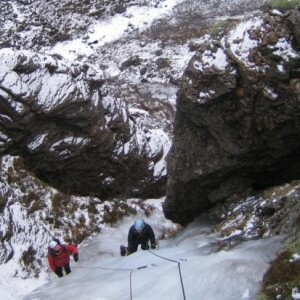 The finish was the most funky, mixture of ice, rock and moss.